ARLINGTON, Texas (AP) — Adrian Beltre went into this offseason pretty sure he had played his last game after 21 big league seasons. While Beltre knows he will miss baseball, the four-time All-Star and five-time Gold Glove third baseman said he is “completely happy” with his decision. 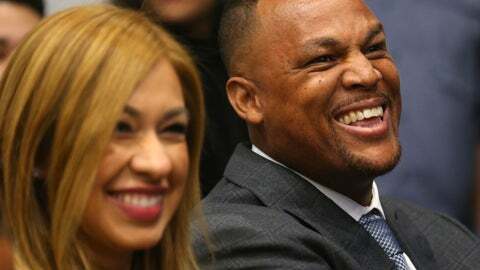 Beltre, who spent the last eight seasons of his Hall of Fame-caliber career with the Texas Rangers, said goodbye in a laughter-filled news conference at the ballpark where he joined the 3,000-hit club in 2017. There were no tears from the 39-year-old Beltre, who had announced his decision 10 days earlier and answered questions for about 30 minutes. “I didn’t expect to be emotional because I’m really happy with what I am doing,” said Beltre, pointing out that he didn’t even have a handkerchief with him. The packed room, decorated with photos and memorabilia from Beltre’s career, included former teammates Elvis Andrus, Michael Young, Yu Darvish, Derek Holland and Ian Kinsler. Beltre’s only World Series appearance came in 2011, his first with the Rangers. That team included Andrus, Young, Holland and Kinsler. Beltre called that team his most fun. His wife Sandra and his three children sat on the front row. Twelve-year-old Adrian Jr. had his own locker in the Rangers clubhouse, and spent many hours in the outfield hitting balls thrown by his father. Beltre’s 14-year-old daughter is in high school and his youngest daughter is 8. About two weeks ago, Beltre called Rangers general manager Jon Daniels to let him know he had made a decision. It started as a solemn conversation, with Beltre telling the GM what a tough decision it was. Belte went on to say he decided he was going to play — for the Los Angeles Dodgers, the team he debuted with in 1998 at age 19. “I don’t know how I responded, if it was awkward silence or I stumbled over my words,” Daniels said. Then Beltre, who also played for Seattle and Boston, started laughing. Eligible for the Hall of Fame ballot in five years, Beltre was a .286 hitter with 477 homers and 1,707 RBIs in 2,933 games. The Dominican’s 3,166 hits rank 16th and are the most by a foreign-born player. He played 2,759 games at third base; only Hall of Famer Brooks Robinson had more. The only time Beltre has been to Cooperstown was in the late 1990s, when he got invited there with the Dodgers while still a teenager in their minor league system. “At that time, I didn’t know how special that place was,” he said. Beltre hit a Texas-high .273 with 15 homers and 65 RBIs in 119 games this season, when he went on the disabled list twice because of a strained left hamstring. He was limited in 2017 to 94 games, his fewest since 77 as a rookie, because of calf and hamstring issues. Those factored into his decision.